Facioscapulohumeral dystrophy is one of the most common forms of muscular dystrophies worldwide. It is a complex and heterogeneous disease secondary to insufficient epigenetic repression of D4Z4 repeats and aberrant expression of DUX4 in skeletal muscles. 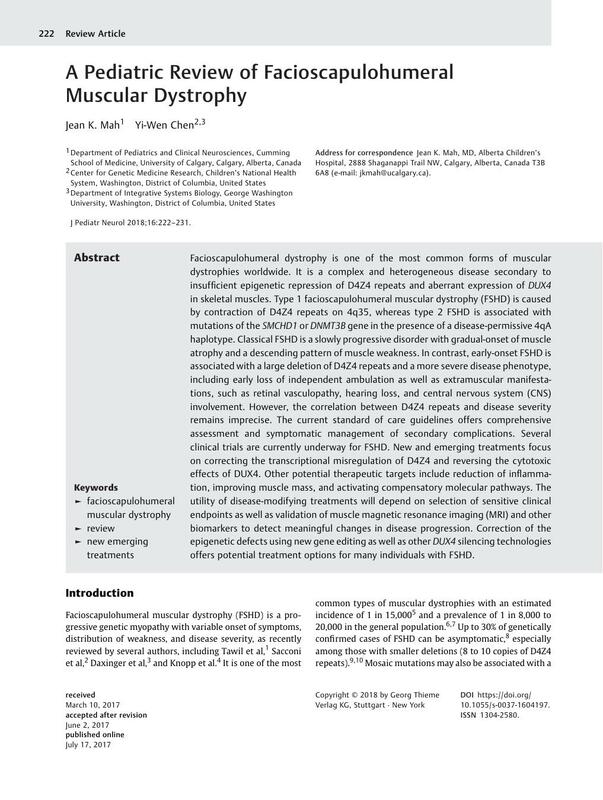 Type 1 facioscapulohumeral muscular dystrophy (FSHD) is caused by contraction of D4Z4 repeats on 4q35, whereas type 2 FSHD is associated with mutations of the SMCHD1 or DNMT3B gene in the presence of a disease-permissive 4qA haplotype. Classical FSHD is a slowly progressive disorder with gradual-onset of muscle atrophy and a descending pattern of muscle weakness. In contrast, early-onset FSHD is associated with a large deletion of D4Z4 repeats and a more severe disease phenotype, including early loss of independent ambulation as well as extramuscular manifestations, such as retinal vasculopathy, hearing loss, and central nervous system (CNS) involvement. However, the correlation between D4Z4 repeats and disease severity remains imprecise. The current standard of care guidelines offers comprehensive assessment and symptomatic management of secondary complications. Several clinical trials are currently underway for FSHD. New and emerging treatments focus on correcting the transcriptional misregulation of D4Z4 and reversing the cytotoxic effects of DUX4. Other potential therapeutic targets include reduction of inflammation, improving muscle mass, and activating compensatory molecular pathways. The utility of disease-modifying treatments will depend on selection of sensitive clinical endpoints as well as validation of muscle magnetic resonance imaging (MRI) and other biomarkers to detect meaningful changes in disease progression. Correction of the epigenetic defects using new gene editing as well as other DUX4 silencing technologies offers potential treatment options for many individuals with FSHD. 86 Feng Q, Snider L, Jagannathan S. , et al. A feedback loop between nonsense-mediated decay and the retrogene DUX4 in facioscapulohumeral muscular dystrophy. eLife 2015; DOI: 10.7554/eLife.04996.